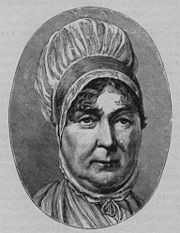 Elizabeth Fry (née Gurney; May 21, 1780 – October 12, 1845) was an English prison reformer who was the driving force in legislation to make the treatment of prisoners more humane. Her work was supported by the reigning monarch, Queen Victoria, and her achievements acknowledged by her depiction on the Bank of England £5 note. It is due to her efforts and achievements that she inspired other women to play fuller roles in society, for at this time is was unusual for women to be involved outside the home. A staunch Quaker, she believed all people, including criminals, were children of God and deserved fair treatment and reformative efforts, not punishment alone. Thus, she opposed the death penalty. Living her life for the sake of others, she practiced kindness to all, believing that love was the greatest gift one can receive and give. Elizabeth Gurney Fry was born on May 21, 1790, in Norwich, Norfolk, England; the third child of a Quaker family. Her family home as a child was Earlham Hall, Norwich, which is now part of the University of East Anglia. Her father, John Gurney, was a successful banker and businessman. In addition to being a partner in the famous Gurney Bank, he was the owner of a wool stapling and spinning factory. Her mother, Catherine, was a member of the Barclay family, who were among the founders of Barclays Bank. Catherine was a great influence on Elizabeth, who was very involved in charity work helping the poor of the district. Elizabeth loved to accompany her mother on these visits. Catherine believed that all children should have a well rounded education, and also insisted that Elizabeth and her siblings spend two hours a day in silent worship. Catherine died when Elizabeth was only twelve years old, and as one of the oldest girls in the family, Elizabeth became partly responsible for the care and training of the younger children, including her brother, Joseph John Gurney. At eighteen years old, the young Elizabeth Gurney was deeply moved by the preaching of William Savery, an American Quaker. Motivated by his words, she took an interest in the poor, the sick, and the imprisoned. She collected old clothes for the poor, visited those who were sick in her neighborhood, and started a Sunday school in her house to teach children to read. During this time, Elizabeth was appointed to the committee responsible for running the Society of Friends school at Ackworth. In July 1799, Elizabeth was introduced to Joseph Fry, the son of a successful Quaker family from Essex. The two married on August 18, 1800, when Elizabeth was only twenty years old, and went to live in Joseph Fry's family home in Plashet (now East Ham in London). They had eleven children in all, including Katherine Fry, who wrote a History of the Parishes of East and West Ham (1888). In March 1811, Elizabeth was recognized officially as a preacher within the Religious Society of Friends. Elizabeth became well known in society. Some people criticized her for having such an influential role as a woman, for at this time it was highly unusual for a woman to be involved outside the home. Others alleged that she was neglecting her duties as a wife and mother in order to conduct her humanitarian work. However, she was granted much appreciation from her admirers, including Queen Victoria. Elizabeth was granted an audience on several occasions, and received monetary contributions to support her cause. She also received a visit at home from the King of Prussia. However, when her husband's bank crashed in 1828, the Fry family was humiliated and forced into poverty. They were removed immediately from the Quaker society. At this time, Fry's brother Joseph John Gurney stepped in to take over the family's finances and control their outstanding debts. He also arranged a salary for Elizabeth that allowed for her to continue her work. In 1813, a friend of the Fry family, Stephen Grellet, visited Newgate Prison. What he saw there deeply shocked him, and he was informed that the conditions in the women’s section were worse. When Grellet told Elizabeth about the way women were treated in Newgate, she decided she must visit the prison. The conditions she saw there horrified her. The women's section was overcrowded with 300 women and children amongst two wards and two cells. Although some of the women had been found guilty of crimes, others were still waiting to be tried. The female prisoners slept on the floor without nightclothes or bedding, and did their own cooking and washing in the small cells in which they slept. It was not unusual for a Quaker to be concerned about the welfare of prisoners, and prison reform had always been important to them. The early Quakers were imprisoned for their beliefs and saw firsthand the dreadful conditions inside these prisons. They felt that there is something of God in everyone, even in people who have committed crimes, so the aim of putting people in prison should be to try to reform them, and not just to punish them. Elizabeth began to visit the women of Newgate Prison on a regular basis. She supplied them with clothes and established a school and a chapel in the prison. Although she was unable to further her work for nearly four years because of difficulties within the Fry family, including financial difficulties in the Fry bank, she returned in 1816, and was eventually able to found a prison school for the children who were imprisoned with their parents. She began a system of supervision that was administered by matrons and monitors. The system required the women to learn how to sew and to read the Bible. The public work of her life dates effectively from the formation of the "Association for the Improvement of Female Prisoners" in Newgate in April 1817. Its aims included the separation of the sexes, classification of criminals, female supervision for women, and adequate provisions for religious and secular instruction. The accomplishments of this association led to the extension of similar methods in other prisons throughout Europe. She visited prisons in Scotland and Northern England. Through a visit to Ireland, which she made in 1827, she directed her attention to other detention houses besides prisons. Her visits led to the improvement of hospital systems and treatment of the insane. Thomas Fowell Buxton, Elizabeth's brother-in-law, was elected to Parliament for Weymouth and began to promote her work among his fellow MPs. In 1818, Elizabeth was called to testify on the conditions prevalent in British prisons to the House of Commons committee, becoming the first woman to present evidence in Parliament. Elizabeth and her brother, Joseph John Gurney, took up the cause of abolishing capital punishment. At that time, people in England could be executed for over 200 crimes. Early appeals to the Home Secretary were all rejected until Sir Robert Peel became the Home Secretary, with whom they were finally granted a receptive audience. They persuaded Peel to introduce a series of prison reforms that included the Gaols Act 1823. In her appeals, she did not demand luxuries for the prisoners, but merely asked that prison life be made the means for reformation, not of degradation, and that everyone that entered imprisonment might have a fair chance to begin life anew on release. Soon after, the pair went on a tour of the prisons in Great Britain. They published their findings of inhumane conditions in a book entitled Notes on a Visit Made to Some of the Prisons in Scotland and the North of England, in 1819. In 1827, Fry wrote a treatise entitled Observations on the Visiting, Superintendence and Government of Female Prisoners. This work concentrated on the importance of prison reform and the great need for reform that was posed during this time. It emphasized important themes such as sisterhood. Other major points of the book touched upon the need for more opportunities for women, along with Elizabeth's broader concerns. Throughout this work and others, she strongly condemned the death penalty. Elizabeth also helped the homeless, establishing a "nightly shelter" in London after seeing the body of a young boy in the winter of 1819-1820. She also set up a "Ladies Committee" to offer hot soup and a bed to homeless women and children. In 1824, during a visit to Brighton, she instituted the Brighton District Visiting Society. This society arranged for volunteers to visit the homes of the poor and provide help and comfort to them. The plan was successful and was duplicated in other districts and towns across Britain. In 1825, Elizabeth started a "Servant's Society" for the help of servants in all situations. Her greatest belief was that by a little kindness their lives might be made happier. A "District Visiting Society" was started by Elizabeth in 1835, after observations of the beggars which infested the streets and frequently called at the house. This society emphasized giving to the poor and beggars. She also promoted the reform of workhouses and hospitals. In 1840, she opened a training school for nurses. Her program was a major inspiration to Florence Nightingale who later on took a team of Elizabeth's nurses to assist wounded soldiers in the Crimean War. Elizabeth Fry spent the last few weeks of her life surrounded by her husband and children. She died at Ramsgate in 1845 and her remains were buried in the Friends's burial ground at Barking. It is reported that over one thousand people stood in silence as her body was buried. Her life's dedication and work was inspiring to people all over the world, especially her followers in England and America. Quaker women took lead from her and began to visit penal institutions in hopes of comforting inmates and also for the possibility of leading them to a path of religious life. Elizabeth's efforts and principles came to play after her death as the major influence in women's prison reform. In 2002, she was depicted on the Bank of England five pound note. Elizabeth Fry is also depicted on two panels of the Quaker tapestry: Panels E5 and E6. The Canadian Association of Elizabeth Fry Societies honors her memory by advocating for women who are in the criminal justice system. They also celebrate and promote a National Elizabeth Fry Week in Canada in the month of May. The Elizabeth Fry Society of Greater Vancouver works with women in conflict with the law. They provide housing, support, and counseling for women and children to help with the improvement of their lives, and aim to help build healthy and safe communities for all. The first Elizabeth Fry society was formally established in Vancouver in the late 1930s. Like so many of the other Elizabeth Fry societies, it started with a small group of women whose wealth and stations in life (something Elizabeth Fry also possessed) provided the perfect opportunities for them to undertake charitable work, thus permitting these women to contribute to those less fortunate than themselves. Gurney, Joseph John and Elizabeth Fry. 1819. Notes on a Visit Made to Some of the Prisons in Scotland and the North of England. A. Constable and Company. Fry, Elizabeth. 1827. Observations on the Visiting, Superintendence and Government of Female Prisoners. London: Published by John and Arthur Arch, Cornhill; Hatchard and Son, Piccadilly; and by S. Wilkin, Norwich. Fry, Elizabeth Gurney. 1883. Elizabeth Fry, philanthropist, preacher, prison-refomer: Life and labors. P.H. Smith. Fry, Elizabeth et. al. 2004. A Brief Memoir of Elizabeth Fry. Kessinger Publishing. 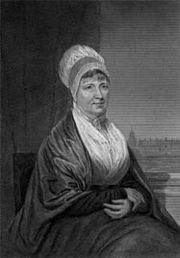 Anderson, George M. "Elizabeth Fry: timeless reformer." America 173 (Fall 1995): 22-3. Clay, Walter Lowe. The Prison Chaplain. Montclair. New Jersey: Patterson Smith, 1969. Fairhurst, James. "The Angel of Prisons." Ireland's Own 4539 (Fall 1996):5. Fry, Katherine. Memoir of the Life of Elizabeth Fry. Montclair, NJ: Patterson Smith, 1974. Lewis, Georgina. Elizabeth Fry. London: Headley Brothers, 1909. Pitman, E.R. Elizabeth Fry. Boston: Roberts Brothers, 1886. Rose, June. Prison Pioneer: The Story of Elizabeth Fry. Quaker Tapestry Booklets, 1994. Samuel, Bill. Elizabeth Gurney Fry (1780-1845) Quaker Prison Reformer. Quakerinfo.com, 2001. Whitney, Janet. Elizabeth Fry: Quaker Heroine. New York: Benjamin Blom, Inc., 1972. A sermon by Elizabeth Fry. The five pound question: Who is Elizabeth Fry? BBC. Association of Elizabeth Fry Societies. Council of Elizabeth Fry Societies of Ontario. Elizabeth Gurney Fry (1780-1845) Quaker Prison Reformer by Bill Samuel. This page was last modified on 13 September 2017, at 16:57.